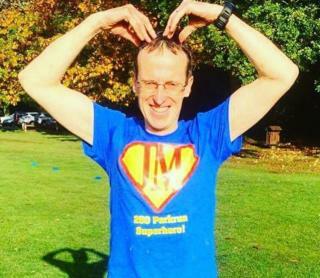 Image caption Jonathan Mainwaring celebrated his 250th Parkrun with the "Mobot"
A runner has been reunited with the "long lost" family he never knew he had after a photo of him celebrating his 250th Parkrun was shared on Facebook. Jonathan Mainwaring, 53, had always thought his father, who died 10 years ago, was an orphan with no family. But a photo of Mr Mainwaring doing Mo Farah's "Mobot" at the Homewood Parkrun in Ottershaw, Surrey, was spotted by relatives of Jimmy Mainwaring. They tracked him down and he went on to meet his father's half-siblings. Mr Mainwaring grew up in Ottershaw with his sister Elaine and their parents. As a young boy, his father was sent to an orphanage in the Lake District, before being moved to a boys' home near Woking. He had tried to find out who his parents were and why he was abandoned, but records had been destroyed. Mr Mainwaring and his sister had also tried to find out more about their family history. "We didn't know of any half-siblings. It was all a shock and really quite emotional," he said. Mr Mainwaring discovered his father had three younger half-siblings, who were brought up by their father in Manchester. Two are still alive - June and Arthur. Both knew they had an older brother, who they had also been looking for. Just a few days after the Parkrun photo was taken, at the end of October, a family member in the US found there was a James Mainwaring who used to live in Ottershaw who had two children. An internet search led the family to the photo, and a reunion was held in Manchester a few weeks later. Mr Mainwaring said old photos showed a strong family resemblance, and he had also been able to learn about the grandfather he never knew. "Social media has made it all a lot easier."